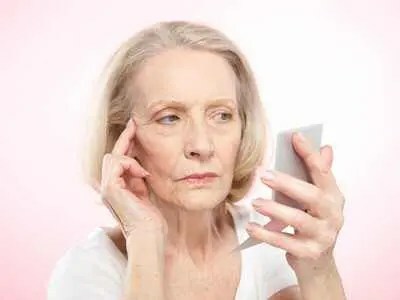 How do you feel when you sit down to unwind in front of the television at the end of the day and you are bombarded with ads that tell you to “Stop the Hands of Time with Mrs. Smith’s Anti-Aging Formula 801”? Or, you may want to try a little cosmetic surgery to lift that chin, or maybe some Botox to iron out those wrinkles. This reminds me of laying my head across the ironing board while taking my mother’s two-ton steam iron to my long curly hair to straighten out the curly tresses that I obviously inherited from some mutant gene, but that was in the early sixties before curls were in. Now, I am in my sixties, and they are telling me to leave the curls while erasing the lines of wisdom and experience from my aging face. I just don’t look good enough—code for “I don’t look young enough”. What don’t I look young enough for, I ask myself. I am fortunate to still be part of the workforce, but maybe if I looked younger I would get that raise I’ve been wanting. Alas, the people that pay my salary know how old I am and assume that I’m not going to make any waves when so many of my peers are shipwrecked on the shore praying that a job, or maybe a little Botox, will arrive to save them. Back to the TV ads. Every time, I see Debbie Boone touting the wonders of Lifestyle Lift, a company that provides facial and neck cosmetic procedures, I wind up in front of the bathroom mirror pulling my obliging skin back to see what I would look like if I just took a little from here and a bit from there. Ugh, I am so mad at myself for even considering for a moment to alter the face I was totally comfortable with only 10 minutes ago. It’s all about ageism. It’s all about the youth culture in which we’ve been immersed. It’s all about the message from the girl whose hair was spread across the ironing board: “Do not trust anyone over 30!” So many retouched faces that we admire are telling us that we can look younger too. But, can we really trust anyone who looks older than sixty or seventy? It’s all so familiar. Remember all those air brushed waifs that were presented to us telling us that we also could become “walking x-rays”? All of a sudden anorexia and bulimia became part of the American lexicon. Whew, that’s a relief. I am definitely not rich enough to have BDD. A number of years ago I attended a “Wise Women’s” conference and participated in a workshop led by a Native American Elder. To this day the image of her stunning lined face stays with me. I thought of how I hoped to look like her when I became an elder myself. The signs of age that mark our bodies are badges of wisdom, something that we need to be proud of, not something to be to be ashamed of—and certainly not something to erase. I don’t want to go back to the age when my skin was perfectly smooth and taut and my mind was empty. It’s time to let advertisers know that we want to see people we can identify with—people (especially women) who look like us. Wrinkles can be beautiful and we need to create a culture that sends the message that lines of wisdom are in.